Varanasi : YEARS OF gender discrimination and an unsafe campus triggered protests by women students at Banaras Hindu University (BHU) last month, even as Vice-Chancellor Girish Chandra Tripathi’s “mistake” to call the police twice to the campus resulted in the incident blowing up, the National Commission for Women (NCW) said on Friday. Following its daylong inquiry at the BHU, the NCW claimed that some practices like unequal curfew timings for women hostelers will be soon done away with. The probe comes after a student was allegedly sexually harassed on her way to the hostel on the campus on September 21. Massive protests were held at the university the day after, with the Varanasi police resorting to lathicharge women to disperse them. Acting NCW chairperson Rekha Sharma said, “I spoke to many students on the campus and in hostels during my six-hour inquiry. I found that the protest last month was triggered because of resentment simmering for years among female students.” “We will submit our report in a week, in which we have made recommendations to the university to do away with gender discriminatory practices like different curfew times for women and men staying on the campus. Curfew timings will soon be made uniform…. I have discussed this with the university,” she added. Sharma said the central library should be open throughout the day instead of being shut in the evening. Referring to women students not being served non-vegetarian food on the campus, she added that they should be served the same food as their male counterparts. “Every female student I spoke to said she feels insecure and there is rampant eve-teasing on the campus. 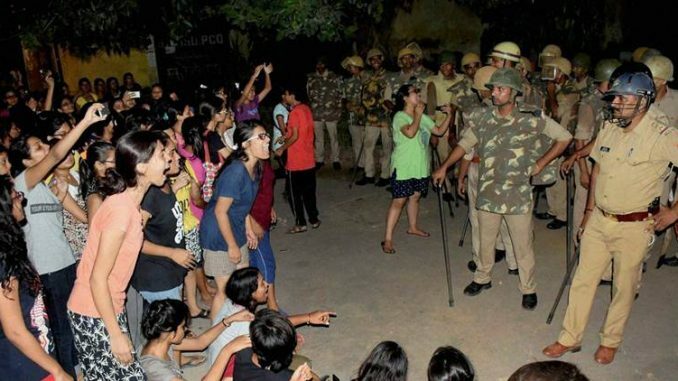 I have spoken to the police and the BHU for increasing security personnel and CCTV cameras… Also, non-students who stay in hostels on the campus will be asked to leave because I was told they are known to cause trouble,” Sharma said.